A lot of time has passed since Lincoln's assassination happened, coming up to 143 years; almost 100 years before John F Kennedy suffered the same fate. Time may be a healer, but it does not answer questions. There are no known photographs of the attack. That's not surprising because in those days cameras were rather large and unwieldy devices that you couldn't fit neatly into your pocket like you can today; not the kind of thing you could carry to the theatre with you; but I include an artists impression of the incident above. On a Good Friday, the 14th of April 1865, at just after 10PM, the actor and Confederate supporter John Wilkes Booth calmly walked into the Ford Theatre in Washington DC. 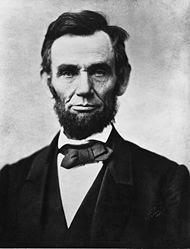 He went up some stairs and approached the private box where Lincoln was sitting with his wife and two friends. 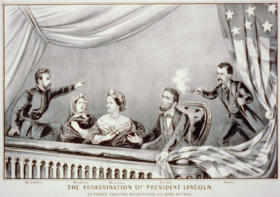 He waited until Act 3 Scene 2 of the play, Our American Cousin by Tom Taylor, when a funny line made the audience laugh, which it is thought he hoped would smother the sound of the gunshot (although his subsequent behavior calls that into question); then he entered the box and shot the president in the back of the head with a small pistol. One of the friends, Major Henry Rathbone, tackled Booth and Booth stabbed him in the arm with a dagger and jumped out of the box into the auditorium. In doing so he broke his leg, but still stood up to shout out the Latin motto of Virginia: Sic Semper Tyrannis, "This is what always happens to tyrants" (Some eyewitnesses claim he shouted other things. Reported are phrases such as Australe Revince "the South is avenged" or, most intriguingly of all, Ewige Blumenkraft which is German for "eternal flower-power", one of the mottoes of the Bavarian Illuminati.). Then he fled from the theatre and the audience and staff were too stunned to stop him. Actually the Lincoln assassination is just as dodgy as the Kennedy assassination. Use Prouty’s Law: John Wilkes Booth arrived at the Ford Theatre and got in through the stage door. Not a problem you might think seeing as he was a famous actor and a familiar face around the theatre, known to all the staff; but then also so were known his staunch political views, surely making him a "prime security risk". What's more: strangely none of the presidential bodyguards were stationed on the small entrances so beloved of assassins, like that stage door. Booth also managed to go to the staircase behind the auditorium and get to the private box unhindered and found it unguarded and unlocked. This was just after the Civil War, a president whom half the country hated and whom every former Confederate citizen wanted dead. The security response to the incident was also suspicious. Although Booth was arrested and shot dead a few days later, he did manage to easily escape from Washington DC because only one of the roads leading out of the city didn't have a roadblock; coincidentally it was the very road Booth used. The way Booth was killed during his capture is reminiscent of how Lee Harvey Oswald was similarly killed, in the following century, by Jack Ruby just after his arrest. A dead man cannot talk! A dead man cannot reveal any underlying conspiracies! Kennedy was killed instantly by a high-powered snipers' rifle which is very apparent on the gruesome Zapruder film. Lincoln was shot from point-blank range in the head, but Booth used a low-calibre pistol which caused less injury, even from so close. If the president had been rushed to hospital it's possible that his life could have been saved, although he would probably have been seriously brain-damaged. Strangely enough, Lincoln was not taken to hospital. He was taken to a nearby house and was declared dead the following morning. There's no record of anyone even sending for a doctor! Why was he killed? Well on the surface it looks obvious: He was taken out by Booth, a staunch Confederate sympathizer, in revenge for the Civil War. But then why did Booth have such an easy time of it? As NORAD was confused and ineffectual on 9/11, a man managed to get from the open street to the theatre's private box without so much as passing a security guard. Maybe it has something to do with the fact that Lincoln was introducing a state money policy, breaking the hold of the banking system by printing “Greenback” dollars… just like Kennedy tried to do almost 100 years later. Today Lincoln's memory is celebrated in a way no other US president's ever has or probably ever will: The Lincoln Memorial http://en.wikipedia.org/wiki/Lincoln_Memorial , a huge Neoclassical mausoleum in the very heart of Washington DC. I think a valuable area of research is to study the Lincoln Memorial to find any tell-tale signs that all is not what it seems. The Illuminati have a fixation with owning up to their crimes in code! They place their secret signatures on everything they do, like putting an "eternal flame" on Kennedy's grave and a black Pentagram on the Pont de l'Alma tunnel where Diana died. Both are very powerful occult symbols. I wonder, did they put a similar "We did it and we're telling you, but you're too ignorant to see it! Ha ha ha!" confession on Lincoln's mausoleum? I'll have to look into it. Lincoln's is also one of the four faces carved onto Mount Rushmore in South Dakota. Mount Rushmore was originally a sacred Indian site and may well have been chosen to be defaced into the famous megasculpture for that very reason: An exercise in power, the triumph and dominance of the White Man over the Indian. There are things in history like this, that have been sewn so neatly into our minds, that we forget to 'have another look'. I appreciate the insight in this. (Funnily enough, over the past few days I've been having 'another look' at something in my country's history too with very interesting results). I'm fine now thanks, WW. I'm interested to hear your own insights into history. I'll come over to your blog. Still following threads on that. However I came upon this on my travels - look familiar? Nice story. Magic, shape-shifting, manifestation are common themes in these old tales. I really like you post.I would like to share page collection with you!